Expansive clay soils (also known as heavy clay or fat clay soil) are soft-textured soils containing minerals that undergo considerable volumetric changes during seasonal moisture fluctuations. They absorb water and expand (swell), as much as ten percent or more when wet, and crack (shrink) when dry. In addition, the water content in expansive clay soils can freeze, compounding the swelling problem with frost heave issues. This cyclical or seasonal change in volume results in shear stresses causing significant lateral and vertical pressures which slowly lead to cracking and buckling of roads and structures built over such soils. Damages and repairs from expansive clays cost billions of dollars every year. Cracked foundations, floors, basement walls, sidewalks, driveways, and patios are all typical types of damage caused by swelling soils. It can also compromise underground infrastructure, cause building foundation problems and ruptured pipe lines. Widely found in our northern climate, Muskeg, sometimes referred to as Peat Bog, is a colloquial term applied to soils rich in peat moss that habitually absorb large amounts of moisture. The result is an extremely soft, swamp-like area that can reach several metres in depth. The low surface tension of muskeg means that an average person standing on it will sink anywhere from a few inches to potentially their full height. It is therefore extremely hazardous and nearly impossible to traverse or build over. While muskeg is not considered frost susceptible, its high water content may allow the upper depths to freeze while still harboring liquid moisture below. Mitigation of the effects of expansive clay on structures built in areas containing expansive clays and soft soils is a major challenge in geotechnical engineering. Sub-zero temperatures will freeze expansive clays and bogs, preventing construction in the winter, while melting runoff, heavy summer rains combined with poor drainage impede construction in the summer. The traditional solution is to excavate and remove the undesirable soil, and replace it with high quality aggregate fill. This method is time-consuming and expensive, particularly if suitable aggregate is not readily available and must be imported. In addition, the depth of the problematic soil will require the equivalent volume of replacement aggregate. The root problem of course, is the resident moisture which will continue to infiltrate the area over time. However, it is possible to build successfully and safely on expansive soils if moisture content can be reduced and stabilized against rapid fluctuation. With the use of NPA geocells, Stratum Logics are the experts in designing structures that conquer expansive clay conditions and other soft subgrades with swelling potential. 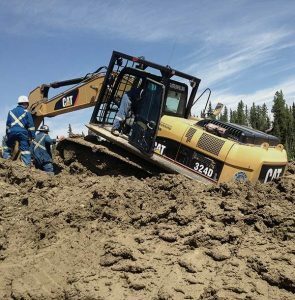 Our specialty is building on weak or impassable soils like muskeg, saturated soils and expansive clays. Our expertise is also uniquely applied to projects affected by extreme cold temperatures that must contend with frost heave and cyclical freeze-thaw stresses.